I practically use this blog to brainstorm and let my raw ideas flow freely. How to choose hijab if you wear eyeglasses? Simple. If you wear eyeglasses, then your eyeglasses is the main focus. If you wear eye wear, then your eye wear is the MAIN contributor to the whole package of yourself. I repeat - MAIN. Even a hairstylist from a website http://www.hairstyle-blog.com/hairstyles-eye-glasses-and-face-shapes.html, claimed that when she decided a great hairstyle for a client, she had second opinion the moment her client put her eyeglasses on. This same rule applies to choosing a hijab. NEVER MAKE THE HIJAB COMPETE WITH YOUR EYEWEAR. Cos both of them stay in the same head territory. hehe. Though classy, pairing chique eyewear with fancy hijabs in some ways make you look older, more serious and unfriendly. Its fine if you want to achieve that kind of effect. "I dont consider my facial features beautiful, but they are all porpotionate and balanced". 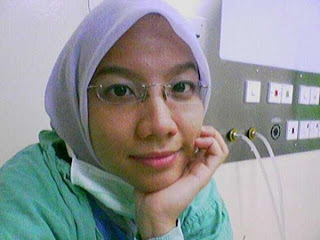 So if you wear fancy eyewear, you are better off with a simple and unfancily tied tudung bawal. Trust me. Resist the temptation to follow the current hijab trends. If your must wear that current hijab trends with awning, choose the unprinted, plain simple ones. 1. Put a little bit of gloss and eye make up. Remember, just enough to make you look fresh. Dont overdo it. Check out these tips in http://www.wikihow.com/Look-Great-with-Glasses. The key to looking good in hijab and eyeframe is to have groomed eyebrows, always. CREAM HIJAB (light) + white frame (light) = too funky, too teeny. leave this for the high school people. CREAM HIJAB (light) + black frame = cool, hip, sophisticated! PINK HIJAB (cool tone) + PINK FRAME (cool tone) = oops...move away malibu barbie! PINK HIJAB (Cool tone) + black with yellow green hues (warm) = CHIQUE! BLACK HIJAB (dark) + black frame (dark) = oops..why are you hiding yourself? BLACK HIJAB (dark) + transparent pink or coral (light) = sweet, understatedly chique and sophisticated. if you wear hijab and clothes of different colours, pairing another complementary coloured eye frame will make you will look too busy. So do not. In such case, you might want to put on a black frame or of colour similar to your outfit. For example, a blue tunic paired with cream hijab. 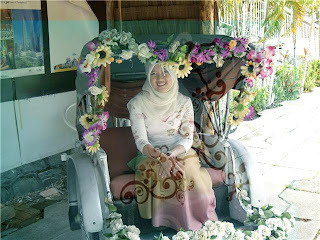 It is easy to think a cream hijab goes with purple frame (complementary color). However, putting on the purple cat eyes will only ruin your simple sophistication. A blue frame or a black frame is a better choice. If you must buy another pair of frame, the trick is not to visit your optham with a black hijab or any dark hijab OR a hijab of colour that you seldom wear. A dark hijab will make any pair of glass you put on look good (when actually its not that good). The moment you switched to light colored hijab later, much of the charm dissapeared and you wished you bought a darker frame perhaps. Again, it makes a difference if you visit your dr with a white hijab, when you know most of the time you look best and would be wearing off-white hijab. An off-white hijab looks great with intense cool colors but a white will look good in warm frames. So again, you are fooled by the charm of brown frames that sits complementarily with your white hijab, when you know, that the only time you wear your white hijab is when everything else is in the laundry. When you rekindled with your favourite off-whites again, much of the charm of brown frame dissapears. 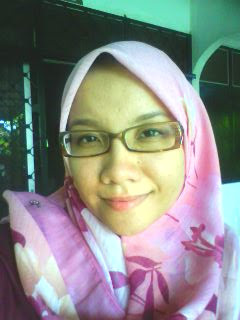 Here, I pair pink hijab (cool tone) with brown eye frame (warm). it has been a while since i wrote my last blog. Have been busy attending job interviews and freelancings. But certainly in my dissapearance, i have been through a lot of situations that led me to write this piece. I have only attended three job interviews, one of which was successful, one of which I failed, and one of which i 'PURPOSEFULLY' failed. Being single and jobless at the moment, I have to admit that the regular advice I received whenever i about to meet someone new or attend a job interview is - BE YOURSELF. "be yourself" - says a neighbour. "be relax. show what you've got. dont be nervous. be yourself". - says a friend. "or you are great. they/he will love you, just be yourself". - says a good friend. "kikie, you are bubbly, cheerful, sweet and smart. just be yourself". - says a friend who was keen to set me up. "kikie. of course you are a little bit clumsy. but that what makes you adorable" - says an old friend. "well, its ok, everybody do silly stuff when they are nervous" - says a mentor. "if they/he cannot accept you the way you are, they the job/fate is not meant for you"
After months of receiving personality and phycological lectures from loved ones, a question popped in my mind. There is when i started observing people and how the term 'being yourself' is used. From my perspective, BEING YOURSELF is a good advice. but it is often abused. Its often being used as an excuse for not improving ourselves. For example, I have a friend who is very short-tempered. She is often seen scolding her guy. She would scold for everything, including when he is five minutes late...even when he is not properly dressed. they were childhood lovers (thus, i am not surprised he really could tolerate her)....however, a recent incident between them became the straw that broke the camel's back...and the guy finally called it quits. Despite the guy's diplomatic request for her to control her temper....she screamed the forbidden excuse...."if you cant accept me for WHO I AM, for MYSELF, then so be it, we are off!". I wonder again...what does it mean BEING YOURSELF? If a person truly loves us, does it mean he must accept our nasty behaviours? When i was manipulated by a friend, and faced the friend with assertion, and open communication, I was told by friends, "why you did not get angry? how could you possibly forgive? why you give in so easily and let people walk over you?you sure not being yourself. I am sure you would have acted differently towards your family. you cant be this forgiving". again..i query...am I a total FAKE and NOT BEING MYSELF? "Sam, you are sure to match John. You are procrastinator. He is punctual. You are Fire. He is water. You are loud. He is quiet. you both are match made in heaven". "Or I am sure may not fit that job. You know me. I am shy in public". "I can't never work in the private sector. Because I hate performance indicators. You know me, i sometimes need to sneek out". "He sure doesnt match me. We are both impatient type". "you guys taking me to museum? c'mon...you know museum thingy is so not me". "you are telling me a girl won't date me because i stink and wear sloppily? so what if i stink like a pig? if she is marries to me, she will soon realise i stink! so why would i pump in the perfumes and deodorants? just to display the FAKE version of myself. i dont kill myself to impress any girl. my family can sleep with me even when i stink. now that is what i call TRUE LOVE!!!" So it goes...the more i hear those commandments of being yourself...the more i get confused!!!! To be honest.... I get very nervous in job interviews...and whenever i am about to attend an interview, my hands will be sweaty...and it becomes more sweaty when my family keep preaching me before the interviews, "now dont you repeat the past mistakes...donts you exude that typical nervous vibes of yours. you have to learn from mistakes". My reaction? i got defensive: "why are you guys so hard on me? have some compassion you guys. I cant believe you all are so mean towards mean. You are supposed to motivate me and have faith in me!!!!!!".... My defense however, didn't do me any good. i arrived the interview, sweaty, whispering to myself...."i can do this. i can do this. i can do this". but yet....i was nervous. And like the fate predicted it, i screwed up and was rejected. At the moment i couldnt take the failure pain....i've got myself into a more severe defensive FALSE MECHANISM; " hey,,...stop punishing yourself. it was not meant to be. it was not your rezeki. if it was meant for you...for some MYSTERIOUS FORCE, you could have answered the interview questions without even trying". "failure is beauty. beauty is failure. failure is a gift. you are so gifted. you are gonna be a great person. because you keep failing.....blablabla.......you must fail......blabla bla....... i love to fail....blablabla....dare to fail....thomas edison finds 1000 ways how not make a light bulb...blablabla.....(sorry dr.fazley)". Then again i attended another job interview and the same process took place - starting from being pre-judged by closed ones, and ended up with me preaching up the 'beauty of failure' lecture to myself. Again, I failed to impress. How gifted i was to have failed so many times. How i wished my story would be victoriously retold in the Chicken soup of Failed Stories. 2. The personality concept is dillusioned. So i took Chandler's advice and apply it in my next interview. Again the process starts with my loved ones scolding me..."now, dont you do that clumsy antics of yours again...blablabla". This time, instead of getting defensive, i just smiled and said. "I wont". While waiting for my turn in interview, i keep telling myself. "I will answer every question accordingly. I am very articulate and relaxed person. I speak well. I know my work. I cant wait to share them". Well.....the rest is history. I got the job! In short, I got the job for CHANGING my clumsy and nervous SELF. the self I was for years. I have created a new person. And i got the job by 'FAKING'. Happy I got the job. but hate the fact my family was right - i should rid that clumsy habit to get my way. The amazing Susan Boyle of Britain Got Talent shows why you need to break the cocoon and become the person you always wanted to be. Even at 47! In her audition, she braved through audience's sceptical response....and proved they are wrong about her! Despite being diagnosed with a heart defect since birth, I consider myself lucky as packaged with the heart problem is a highrate metabolism which keeps me slim (no matter how much I eat and how much I sleep). I can escape cardiovascular workout and just concentrate on strenghtening workout to remain slim. However, recently, an observation struck me that cardiovascular patients are not the only lucky ones: marathon walkers too! I am a fan of athletic sports and I have watched Usain Bolt and Johanna Jackson live on TV and again and again on YouTube. 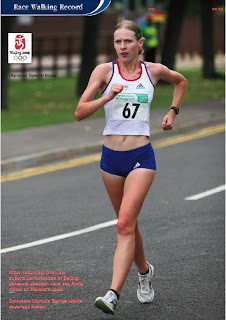 I have also watched other racewalkers. Then, I took a probably late notice: all racewalkers are amazing slim and thin. While runners are fit and muscular, walkers are fit and LEAN. Being the usual me, i began to query? It what ways walking exercise magically make the figure leaner? It is like, racewalkers don't grown muscles but 'elongate' their muscles. I learned from a book 'Racewalking' that walking burn a dozen times more calories than jogging. In fact, walking inside the swimming pool burns dozens of calories more than walking on land and hill. 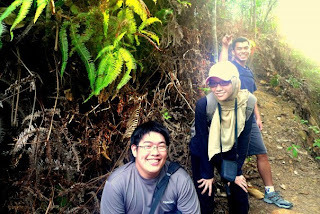 My idea is that in walking, we not only sweat, but we do exertion, compared to jogging. When we walk, our hands swings against the wind and one of our feet must not skip the earth beneath. We do lower exertion compared to jogging. Thus, creating resistance like those we obtain from our exercise machines. If you see how ballerinas have great figures, its because of this slow exertion of target muscles. This combination of streghtening and pace what makes calories burning surpass those exercised from jogging. On the other hand, to continue burning calories in jogging, many beginners try to pust their limits in order feel that they have workout. Another secret code of walking benefits have to do with the heart rate difference in walking compared to jogging and other exercises. It seems that walking allows the body to be in fat-burning mode longer compared to other exercises, so to speak. Finally, i believe that walking allows us to be in fat-burning mode longer because we can do it longer as it is a fun exercise! i look forward to walk around the park in my university after the morning prayer. the wind is breezy, the air is fresh and the people are happy and smiling. the birds are chirping and greeting you! I have my linkin park music standby always in the morning and I'd walk according to the rythm. I particularly pick Linkin park, because the musics have slow beats which accelerates towards the end. Thus my feet are guided. Heart beat can tell if you have been exercising. the lower rate the heart beats, the healthier your heart is. You can put on make up and pretend to be healthy, but the cardiologist will know if you are lying. I knew this when i have not been exercising for three weeks and my cardiologist put on the stetoscope on me and asked, "why have you not been walking?" I had a lunch with friend Andy and we had a really inspiring conversation about creative freelancing. She proposed to merge her photographic talent with my writing. I then saw her portfolio, and I must admit, they were mind-blowing superb captures of portraits and panoramas. Trouble is, such captures call for descriptive writing which I have no experience in. I write mostly informative and critical pieces. I heard that writing descriptives needs you to be a walking dictionary, knowing the right vocab at the right time. But then I thought, rather than undermining myself, I would rather spill my RAW descriptive attempt. Finding a topic is difficult. But then I thought what story could be written from my self-portrait photographs. As I schemed through my local magazines, an idea struck me – hijab! Living among middle-eastern neighbours for nearly six years, I have observed the many trends of hijabs. I don’t proclaim myself to be expert in fashion, let alone Islamic fashion. (I started wearing them during college). Even during the early years, I couldn’t wear them properly, having stray hairs coming out and my friends labeling me as untidy. 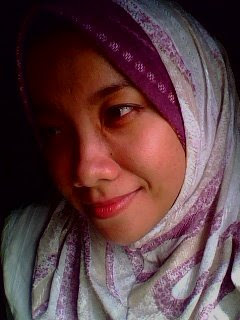 Like many Malays, I usually wear the classic tudung bawal – a square hijab with cottony texture. 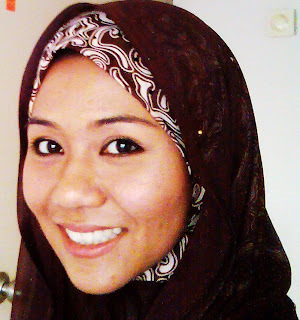 Tudung bawal works for many Muslims in Malaysian climate, as it is cool and absorbent. Most Malaysians wear it by folding it into triangle, putting it on head, pin under chin and finally pin diagonally on shoulders. They also flatter our Asian faces and come in any colour imaginable. The 45inches material is a favourite to many, students and corporate alike, until innovations came in. From my observation, there are two distinct hijab innovations in Malaysia. The first is the emergence of 'a hybrid between selendang and tudung bawal'. Hijab innovaters somehow, sew in a readymade cap with a selendang for ease of use. They are great innovations, judging from their convenience and flattering effect to the face. Examples are the Dubai and Morrocan hijab. The second innovation is the many ways a plain tudung bawal could be folded. Hence, come the 'small roses on ear', the 'braid-style' and many more. Hijab innovations are blessings too many, but somehow, enthusiasts got too carried away with the don, resulting in serious waldrobe malfunctions! Hijab: What not to wear! If you wear ruffles, do not attempt pleated style on shoulders. You end up looking like a clown. The golden rule is to match opposite textures. 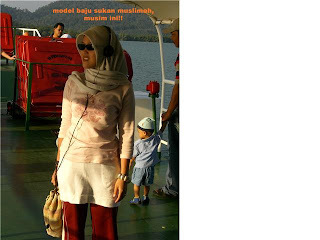 The more flamboyant and superficial the outfit, the simpler the hijab style. The opposite is also true. Silk loose baju kurung works best with crisp tudung bawal and Syria hijab. If you put on that masculine, crisp corporate shirt, then you can carry that Dubai wrap or superficial feminine selendang. If you are wearing heavy textures, like cardigans and jackets, silky Bellisimia works great on you. Think yin and yang. Hard and soft, feminine and masculine, soft and crisp. Match them together. My 16 year old niece looks chique just by wearing a pair of jeans, a plain shirt and a simple tudung bawal. When I asked her secrets, she said “don’t wear too many colours. Keep it to two colours”. Which means, if your outfit has two colours, then your hijab should exactly match the main colour of your outfit. Sounds boring? Try it and tell me if you are complimented. I guess its by applying this rule that my friend, Lyn looks classy even in a muted grey cargo pants! Many Islamic fashion magazines suggest this. It works if you are not wearing hijab and are choosing the color of your neck scarf. But believe me, it is a horrific fashion faux. I have seen people copying this look in magazines and on streets and the effect? – hilarious! I agreed with profound local Islamic fashion designer, Yasmin Siddik (in her book Sopan & Anggun pelbagai gaya bertudung): your hijab should follow the main colour of your clothes, or two shaders lighter. You can buy her books in local bookstores. Sorry girls, if you wear hijab, then you can’t put on that british wedding gown. Hijab means modesty. And lack of modesty is what killing the beauty of Muslim girls wearing hijab. The least you call for attention, the more flattering you look. If you really need to wear that colourful pleated shirt you bought from Bali and make it work for you, just wrap your head with a simple black selendang. Don't: Thinking “if that works on her, then it will work on me”. Your face shape is different from that lovely manniquin. 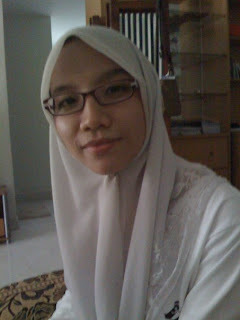 If you have small triangle face (like mine), you cant put that thick cap (anak tudung) which makes your forehead wider. On the other hand, it looks flattering on my friends, Nurul’s round face. My friend, Ilya, has a lovely diamond shape face with prominent cheekbones, and she exudes elegance in that brown Morocco with temple-level cap. Yasmin Sidik and Dara.com were right, the bigger and more squarish your face, the lower and seamless your face side fold. A Moroccan hijab with temple-level cap enhances my friend, ilya's facial asset - her high cheekbones. Generally, your first impression is your face, and hijab in some way, enhance women beautiful facial features. So if you wear one, and pair it with an outfit that slightly or totally reveals your body shape, a lot of your mystery and beauty disappear. The eyes watching will be shifted to your body instead. Remember, the mystery of a woman in hijab is what intrigues eyes of beholders! o: Make only one focal pointA tube underneath a PDI cardigan works best with a simple, plain hijab of same color to your cardigan. Period. Wear a printed belisimia, people forget your cardigan is a PDI. The same applies to a flare printed skirt. pair it with plain shirt and a plain tudung bawal (dont try to fold the hijab fancily). Goldent rule is to choose only ONE focal point of your attire. If your really need to make that braid style, then just pair it with simple plain shirt and pencil skirt. Don't: Thinking "that hijab is ugly"
No hijab is ugly. No color is boring. No design is unappealing. AND, no hijab is beautiful either. Don't believe regular fashion commentators who advise you 'to avoid bright colors near your face'.Remember, what makes it beautiful is the whole combination: your hijab AND your outfit. Considering ditching that old washed light jean blouse? Not really a good idea. Me and a friend have bumped into a lady pairing such blouse with a vivid, bold blue batik shawl (as hijab). The result - forget the old blouse, that 40 something turned heads! So, never, ever, underestimate the batik shawl you've got as a luncheon souvenir. Bought a RM45 square Murtada and think you can wear it just by foldin g it into triangle? Why not try something a bit more daring? take a needle, a thread and sew into triangle. Then make your own cap and attach it to the triangled murtada. You make your own unique hybrid. I've attempted this and even had a hijab merchant asking me where I bought it! I've also cut, sewed and improvised a Syria hijab to suit my face shape. If you think you are doing a great deal hunting for a blue hijab with exact sunflower embroidery design to match your blue sunflower-embroidered baju kurung in a crowded street market, then be sure you are wasting your time and energy. Color-coordination is a must- but don’t go overboard. As we are all know the rule of human relation, no impression is made by one who is trying too hard! My friend Julie knows this rule. She always likes to coordinate the color her clothes, but the colors are not necessarily in the same shade and design. She could wear a brown kebaya and pair it with an unthinkable shade of cream hijab she used to wear to the gym. And it damn works! I always think of her wardrobe as ‘co-incident’. It as if, she never planned what she is going to wear and never bought an outfit and a matching hijab at the same time. It is like, she just woke up in the morning, take a shower, open the wardrobe and see what match from what available. I remember her as being voted the most stylish girl back in campus years (and she is still now!). Think of this: you have a plain light pink baju kurung. What hijab color suits you best? A plain light pink hijab? Good. A printed light pink hijab? Better. A plain white hijab you used to wear to the sundry shop? Best! wearing a simple hijab style enhance julie's casual but chique outfit. Concentrating on one focal point (which is the red pants), julie shows why a cream colored hijab works better than a red one! again, julie pairs a superficial flare skirt with a plain blouse and hijab. If you really must make a 'rose' out of that tudung bawalI really dont quite favour wrapping your hijab tightly around your neck for three reasons. First, it enlarges your neck. Second, it ruins your coy persona. Thirdly, its chokingly uncomfortable. The more flare the hijab rests around your neck, the more pleasing, feminine and mysterious your face appear. Despite simplicity, I always think MP Nurul Izzah has an effective way of putting hijab. Her imperfection is perfection! She proves that the more you left hijab flare around your neck, the more pleasant and modest you look. So there we have the dos and donts of wearing hijab! (though I still think my work looks like a critical writing). Nevertheless, i acknowledge that hijab tastes vary across cultures. The vast communities of muslim women however, gives room for more ideas, innovations and creativity. I've faced it. To be among 66% of late bloomers white collars who found out they were in wrong career. Worst, i've studied 10 years, in a field that i discovered does not fit me. Apparently, i'm completing my doctorate in the said field. Three years back at my first postgraduate graduation, i thought of officially saying goodbye to this field. i talked with people and get sneered. i talked with family and the response i got was, "you are not working in the industry yet, who knows you will grow to love it". Probably approval seeking, probably not, but i took chances. Perhaps, (hopefully) i will grow to love this field despite my inner self screaming 'why?'. To cut the story short, i pursued PhD, unplanned and out of nowhere. and for the love of God, I can't believe i'm arriving the finishing line - in a field that i presumed to have no future in. Coaches, friends, families lauded my achievement. but me.... i thought the reason i arrived so far was just because of my constant self-critism. When i lack passion and enthusiams, i beat myself, telling me that i do not work hard enough. I feel guilty whenever watching that 30 minute sitcom during study breaks. In short, i live by the rule, 'to be happy is not working what you like, but liking your work'...(i've already forgotten how they are worded). So, i kind of pushing my self to create that 'LIKING' everyday. Then i bumped into Oprah's caption on yahoo dailys (i didn't remember how they were worded) - "when you do something and it feels right, then its for you"...something like that. I was struck with a moment of dissapointment, not for wasting time doing something i don't like, but worst - NOT EVEN KNOWING WHAT I WANTED TO DO. Did I waste 10 years of my time? All of the hardworks, just for my name being beautifully crafted on a laminated scroll? Just to have a 'DR' written on every wedding invitation? I almost thought that this the silliest mistake I've made in my life. But then, life began to take a new leaf in august 2008. I have not only realised my true passion, but better, having to realise how 'my wasted-10-years-writing-that-some600-pages-theses' have led me to discover my true passion. no life experience is wasted after all. I'm always in thirst for old manuscripts and knowledge. I make a decent living googling, joining unrelated ideas together, critising (in a healthy way), analysing, organising ideas, and ultimately, writing an artistic piece of work.